not only that it is a good source of iron that is actually very good for women especially during pregnancy. But that it is also good for the heart, i really do hope that people with heart problems could be able to read this article. Ask your doctor or dietitian or doctor for more information on this subject. I hope this answers your question and helps with the confusion of the booklet the gave you. Broccoli isn’t called the king of the crucifers for nothing. 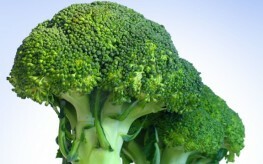 The healing power of “Broccoli” can help: protect against heart disease, fight cancer, and boost immunity. Broccoli is an excellent source of beta-carotene, sulforaphane, and 13C, broccoli contains a variety of other nutrients, each of which can help fend off a host of conditions, from heart disease to osteoporosis. For example—just a half-of-cup cooked broccoli contains 85% of the daily value for vitamin C. This antioxidant vitamin has been proven in studies to help boost immunity and fight diseases like heart disease and cancer. Broccoli is also rich in folate, a nutrient that is essential for normal tissue growth and that studies show may protect against cancer, heart disease, and birth defects. Broccoli is the best vegetable sources of calcium, packing in 72 mg per cooked cup—about a quarter of the amount in an 8 oz. glass of fat-free milk. Calcium is well documented as the single most important nutrient that women need to keep osteoporosis (the breaking of bones) at bay. I am so confused, I had a heart attack and had a stent put in. they gave me a booklet as to what is good for me and what is not. I was told in the book to avoid broccoli, spinach and eggs. Then I read it is ok. What exactly am I to eat? I was also told I could never use a hot tub again.?,? Can anyone, please. tell me if there is anything that is absolutely safe after heart attack? Eat IT! My husband had a heart attack and 3 bypasses. If you are on a blood thinner, don't eat a lot at one time. You do have to watch your Vitamin K vegies….eat it about 2x a week. Do your research…the Internet is a wealth of information. This website is worth it's weight in gold…..the data on each and every vegie is there. You will be sure to find all the information you will need. Explore the world of seeds, nuts, lentils, and juicing.